In November, 2018 we made a 20 day trip to Patagonia, primarily to do some hiking in the famous mountains of southern Chile and Argentina. We flew to Santiago, Chile which is about in the middle of the country and then to Punta Arenas, the largest town in Patagonia. Travel time from take-off to touch-down was about 28 hours. In Punta Arenas we rented a car to drive up to Torres del Paine National Park. We also visited El Calafate and El Chalten in Argentina for more splendid hiking in much better weather than we had in TdP. Our rental car parked on a street in Punta Arenas. Parallel parking can be quite challenging here! We explored various options for renting and returning the rental car. It was virtually impossible to rent a car in Chile and return it in Argentina, and prohibitively expensive to rent and drop off in different Chilean cities. So we had to return to Punta Arenas to drop off the car at the end of our hiking. Crossing the border into Argentina with a rental car is also a hassle. We rented from Avis in Punta Arenas, and I followed the advice of some on-line commentators to contact Avis 10 days before our pickup to initiate the paperwork to cross the border. When I went to pick up the car, they had record of this request, but apparently didn’t actually do anything because it took about 45 minutes for the clerk to fill out all of the necessary paperwork. This included having to sign a paper that we would not take a ‘shortcut’ on the way from Torres del Paine to El Calafate. So after more than an hour in the Avis rental office, they finally drove the car out from the garage but it had a flat tire, not just low on air but dead flat. They called their mechanic, who arrived 20 minutes later and he promptly went to work taking a tire off of the car he drove in and exchanging it for the flat on mine. It was not possible to simply switch cars because all of the paperwork had the original car’s ID. Meanwhile Lil was back in the Airbnb waiting and wondering why it took over 2 hours to rent the car. The positive aspect of the car rental is that Avis did all of the paperwork for crossing the border correctly so we had no trouble at the border, at least where we crossed at Cerro Castillo both ways. However, the time one spends in crossing the border is also strongly dependent upon whether a tour bus full of tourists arrived just before you did. With bad timing, it can easily take an hour or more to cross the border since you have to have your papers checked on both the Chilean and Argentinian side. One feels like you are crossing from North to South Korea. 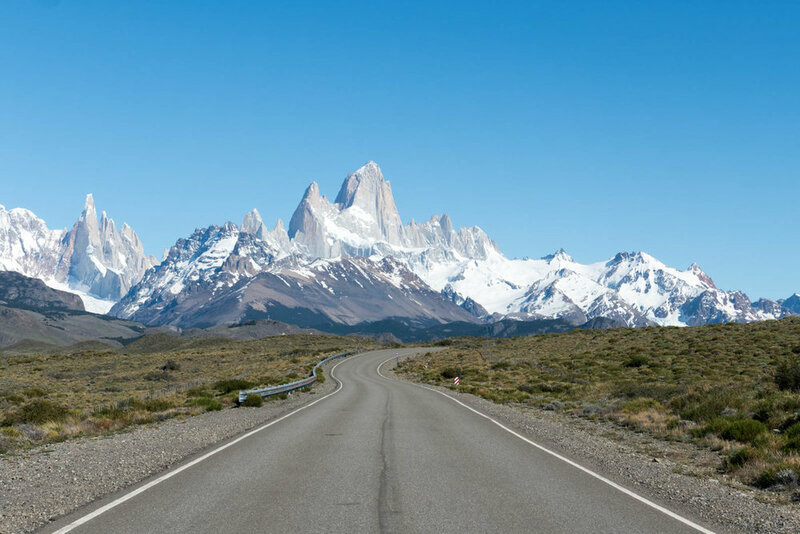 After passing the Chilean checkpoint, one drives about 10 km through a 'neutral’ zone before arriving at the Argentinian checkpoint. Oddly, halfway through the neutral zone the road changes from paved to rough gravel on the Argentine side. Not a great introduction to the country! 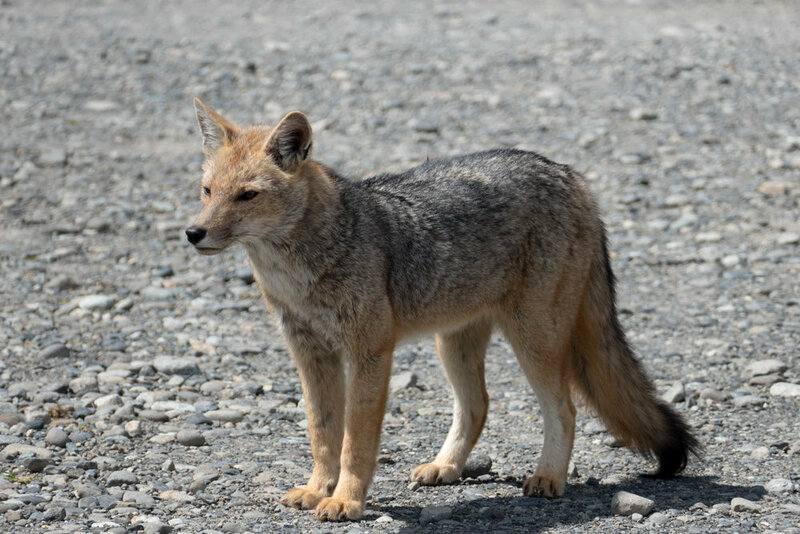 Another difficulty is that Chile is very strict about bringing in any food or seeds so they had a dog who came to sniff for any fruits and vegetables in the backpacks and inside the car and trunk. Our campsite at Torres Central. In addition to the nice tent with flat floor, it also had a nice thick foam pad mattress. We used our own sleeping bags. The jewel of the Chilean hiking experience in southern Patagonia is Torres del Paine National Park. The hiking is not at altitude since you begin from about sea level but the jagged peaks are spectacular. For the first three nights in the park we camped at the Torres Central camping site which is close to the main entrance to the park at Laguna Amarga. Since we decided to come to Patagonia at the last minute, the camping sites were some of the last options. Getting reservations in TdP is notoriously difficult, especially if you want to take one of the two classical multi-day circuits, the W or O route. People plan these routes months in advance since spaces are very limited. There are several on-line blogs and websites devoted just on how best to reserve the necessary campsites. The good news about the arrangement is that there are dining rooms available at most of the refugios so you don’t need to bring food if you sign up for the food option. The bad news is that the food is not very good. Breakfast and the box lunches were fine but the dinners were barely edible. Nevertheless there is a very nice vibe in the dining hall with all of the serious hikers at the refugio and since you are eating together, inevitably, you get to talk to many of them. We met one group of Chileans who we did not really converse with much because of our limited Spanish. Nonetheless, when we said good-bye, they gave us a kiss like good friends do. The other group we ate with were 5 young Americans who did the hike to the base of the Torres in 6 hours total (it took us about 10+ hours!). 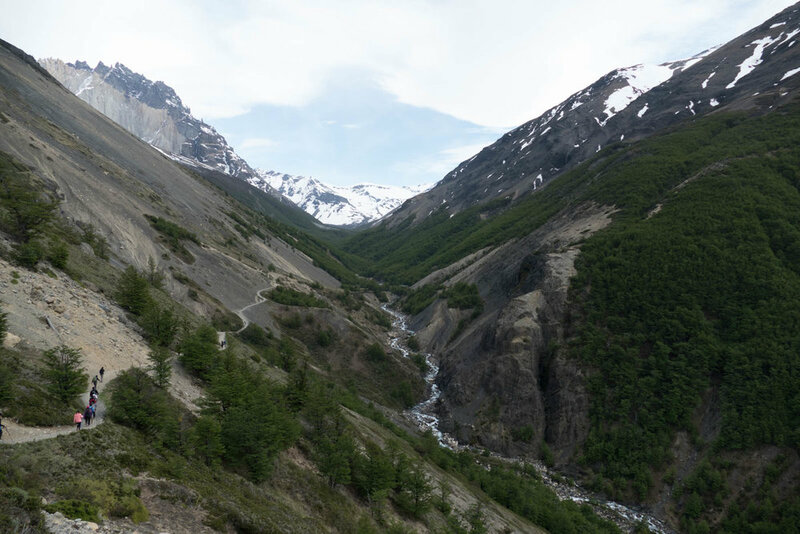 The most famous hike in Torres del Paine is part of the W circuit from Torres Central to the base of the Torres (towers). This hike is classified as difficult and rated as 3-4 hours each way. It took us a total of about 11 hours with a break for lunch at refugio Chileno and about a half hour at the top. Unfortunately the weather did not cooperate. When we started out the skies were partly cloudy with some sunshine but the weather worsened steadily as we climbed. By the time we got to the top, the torres were totally socked in and it began to sleet and blow hard. And in Patagonia, it can blow very hard! The last 2 kms or so were particularly difficult since it is essentially scrambling over boulders. I timed our descent from the top to a sign that said it was 45 minutes to the top. This section, going downhill, took us 75 minutes! We knew we were slow since many people passed us, while we rarely passed anyone else. The hike is very popular so at least you are rarely alone. We had to get back to the refugio Central by dinner time, so there was some urgency to get back before dark. It was disappointing not to get a good view of the Torres after such a long struggle, but this is not an uncommon experience here. The good news is that this was the worst weather we experienced on this trip but of course we didn’t know that at the time. Our group of American friends did the hike on the following day and had fantastic weather- clear skies and sunshine. But they were upset with the hike because it was so crowded that they often had to wait for the slowest hiker to negotiate the narrow and steep boulders. Socked in at the top. Panorama view of the base of the Torres, shrouded in the clouds. At this time it was blowing hard and sleeting. The positive thing was that we made use of all the layers we had carried up the mountain. After the exhausting first hike, we took it easy the next day with an easy hike to Mirador Cuernos. 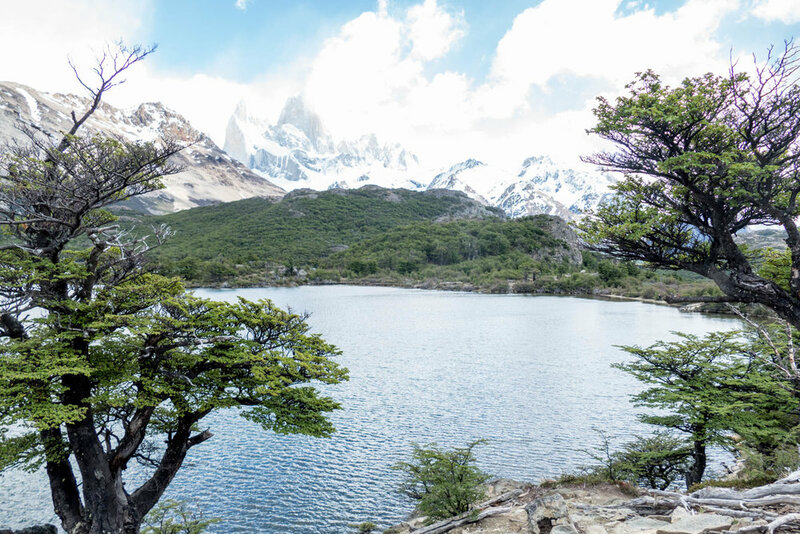 The hike has one of the best views of the Cuernos, which means ‘horns’ in Spanish and refers to the unusual shape of this mountain range, quite striking with the lovely Lake Nordenskjold below the mountains. The day was overcast but at least when we began the hike it was unusually calm with virtually no wind so the lakes on the way to the mirador were mirror-like. After 3 nights camping at Torres Central, we moved to Hosteria Pehoe which is closer to the center of the park. We drove the section between Torres Central and Pehoe several times and saw many guanaco (see below) on most of these drives. We had originally planned to stay at Pehoe for 2 days but our flight from Punta Arenas to Santiago was canceled and we had to leave a day earlier than expected, which necessitated cutting one day off of our itinerary. The hike to the mirador is a bit confusing. Most of the maps show the hike starting from the camping Pehoe site. But our host at the hosteria said to take the hike from a small parking spot just past the hosteria entrance. But she wasn’t even clear if the hike went to Mirador Condor. Turns out that both of these hikes lead up to the mirador, just from different directions. There’s a great 360 deg panoramic view from the top of the Mirador and there were also condors to be seen. View from the top of the Mirador Condor. The island in the foreground houses the Hosteria Pehoe where we stayed. The hosteria is accessed by the narrow foot bridge. Hosteria Pehoe. Our rental car is visible in the parking lot just past the Hosteria parking lot. After leaving the Torres del Paine park we crossed the border into Argentina at Cerro Castillo and drove up to El Calafate. Most people go to El Calafate to visit the Perito Moreno glacier which is in the Las Glaciares National Park. 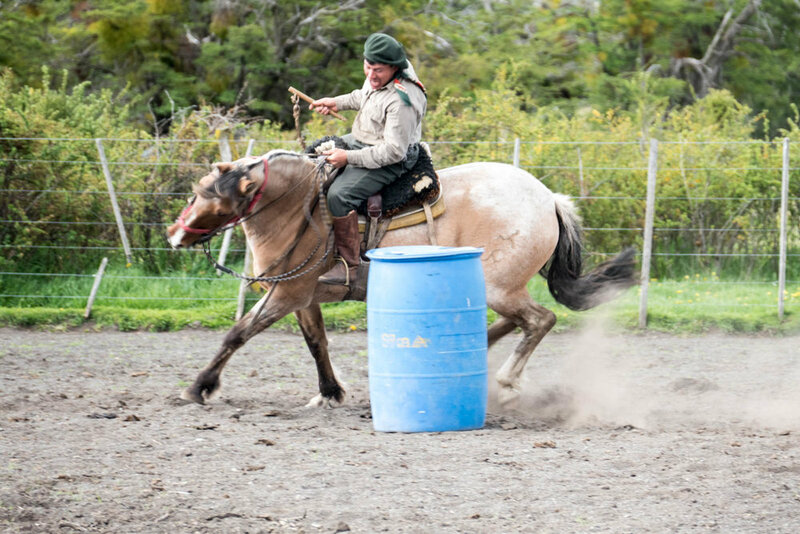 Before going to see the glacier, we spent two nights at an estancia (ranch) Nibepo Aike which is physically located in the park but some 80 km from the Perito Moreno glacier. Nibepo Aike is a working sheep and cattle ranch but has also been remodeled to be a luxurious estancia for tourists, where all meals and activities are included. Some of our best meals were at the ranch. The ranch is located in a spectacular setting. 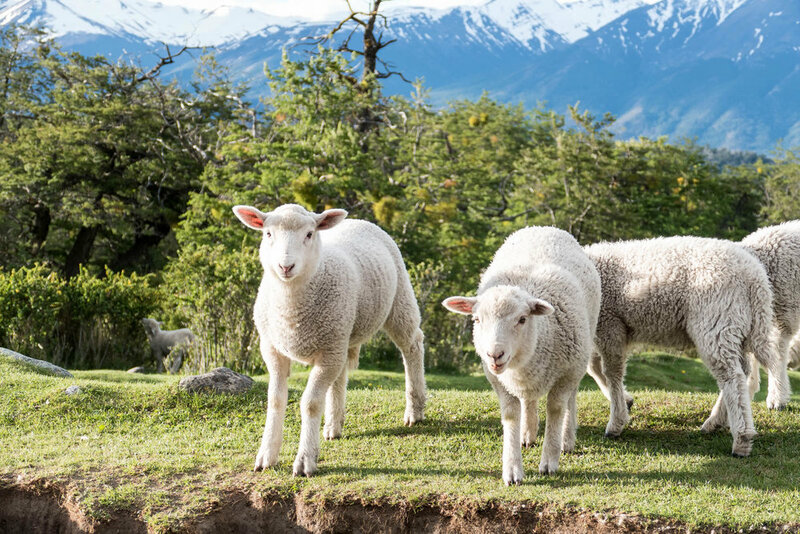 In addition to hiking and horseback riding, the gauchos give demonstrations of sheep shearing, cow milking, and one can watch the sheep dogs taking the sheep out to pasture in the morning and bringing them back in the afternoon. 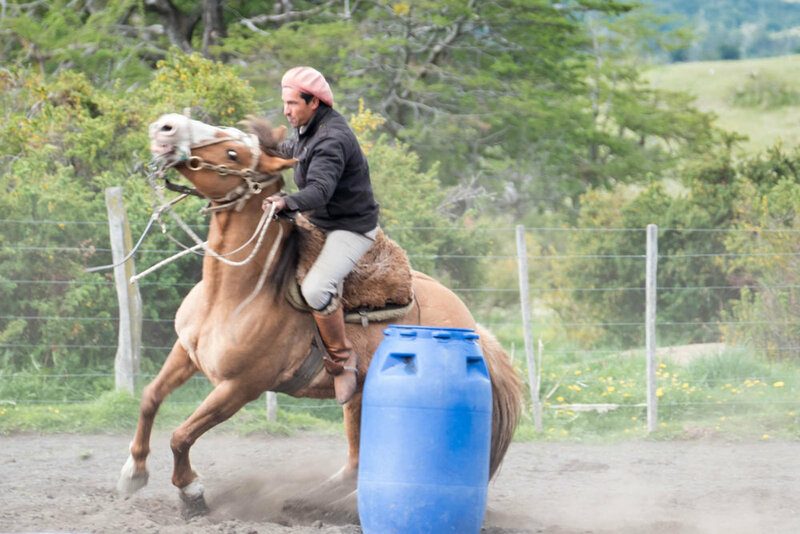 The estancia is over 100 years old and they are proud of their heritage. 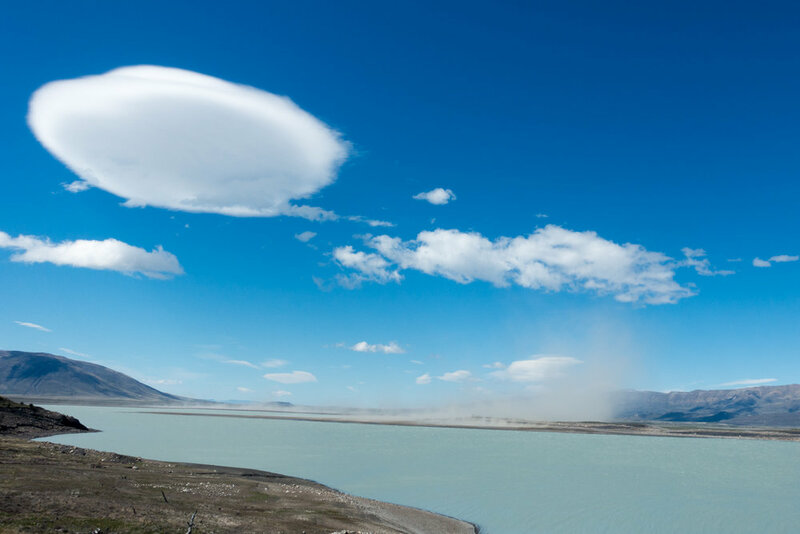 The major reason people come to El Calafate is to see the Perito Moreno glacier, which is one of the only glaciers in the world that is advancing rather than retreating. The glacier is some 75 m thick at the point where you get the closest view from the mainland and over 700 m deep at it’s thickest. The excitement here is to witness (see and hear) the bits of the glacier as they fall into Argentino Lake. The pressure of the ice pushes, at glacial speed, the glacier into the lake and intermittently pieces of ice fall into the lake. The surprising thing is how loud of a crash the ice makes as it falls into the lake. Even tiny bits that look to be the size of a large snowball make a loud cracking sound as they hit the water and ice. Granted, they are probably actually the size of an automobile but simply look small compared to the size of the glacier. Of course, it is impossible to predict where or when these will happen, so one stands there prepared to look anywhere. After spending the morning at Perito Moreno, we then drove to the northern part of the Los Glacieres National Park to the small village of El Chalten, which is at the base of a spectacular mountain range known as the FitzRoy massif. The town is only about 30 years old and basically sprang up to support the hikers and climbers who come to tackle the superb hikes in the area. 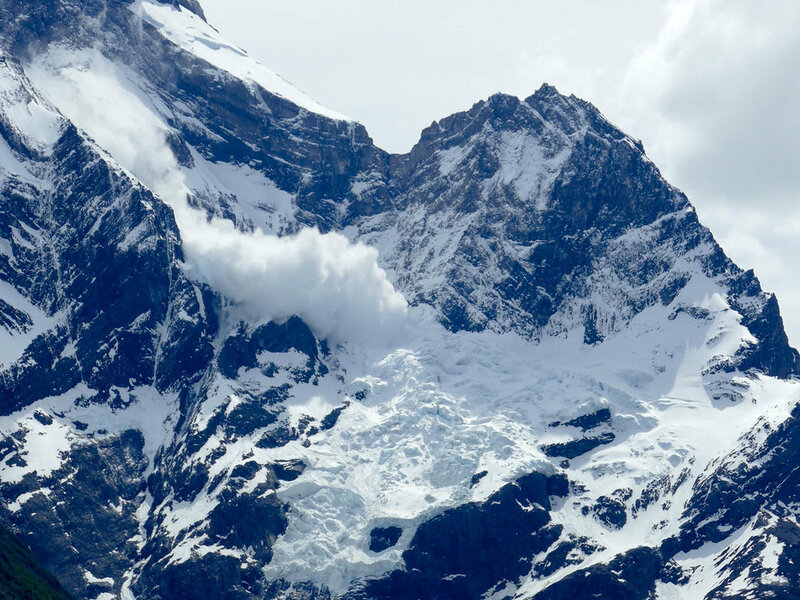 You may recognize the profile of the mountain range as it served as the model for the logo of the Patagonia brand of camping gear which was founded by the famous mountaineer, Yvon Chouinard. 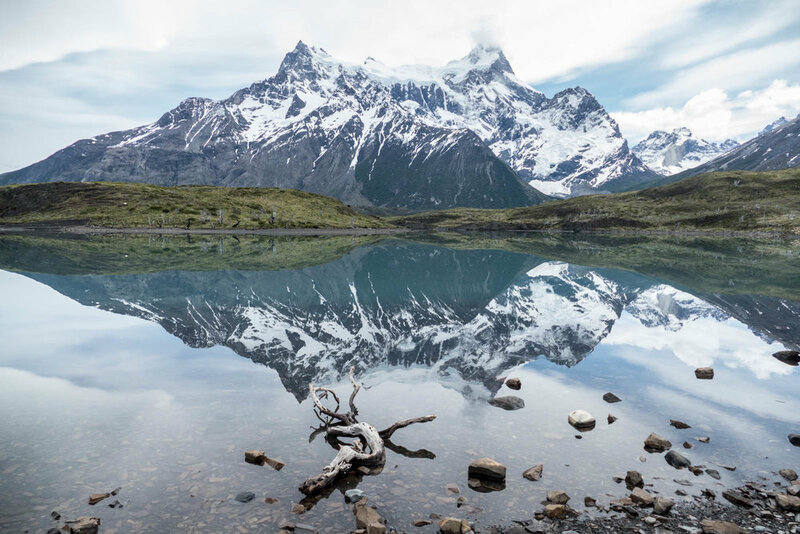 Unlike Torres del Paine, most of the hikes here are day hikes and one does not have to make reservations for campsites, at least as far as we could make out. The down side is that there is no food or camping facilities on the hikes. The scenery is equally spectacular, and we had much better weather here. We took this easy hike as a way to ease into hiking after several comfortable days at the estancia. The hike starts at the El Pilar Inn which is about a 20 km drive up a rough gravel road that follows the Rio de las Vueltas. The hike begins with a great view of FitzRoy which was called Chalten (smoking mountain) by the native Indians because it usually had ‘smoke’ at the peak. The weather was clear and sunny when we began the hike, but by the time we got to the mirador, it was cloudy and began to blow hard. By the time we got back to the car, the wind had picked up considerably and was raining/sleeting. It is commonly said that one can experience all four seasons in one day in Patagonia and this was a good example. The following day we took the hike to Laguna Capri. This is also a relatively easy hike with spectacular views of FitzRoy along the way. As you can see, we had fantastic weather for this hike. 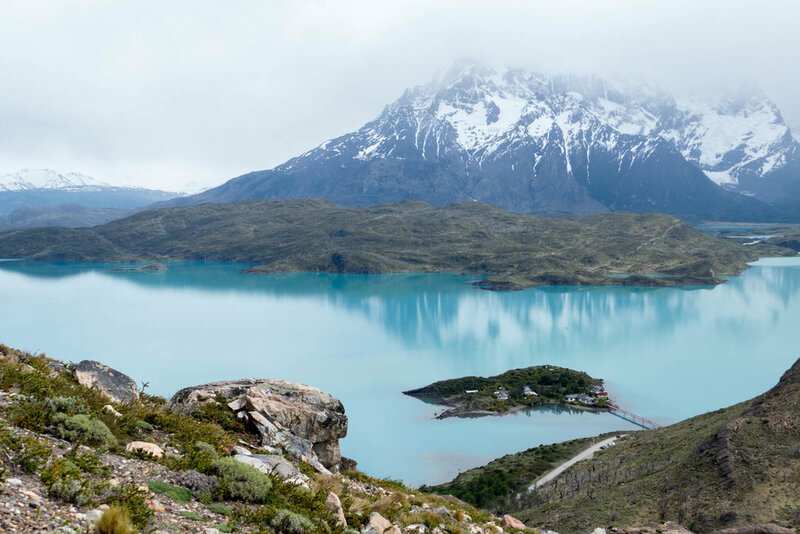 The most famous and most difficult hike from El Chalten is the one to Laguna de los Tres. We did not attempt this hike but instead did the second-most famous hike, to Laguna Torre. 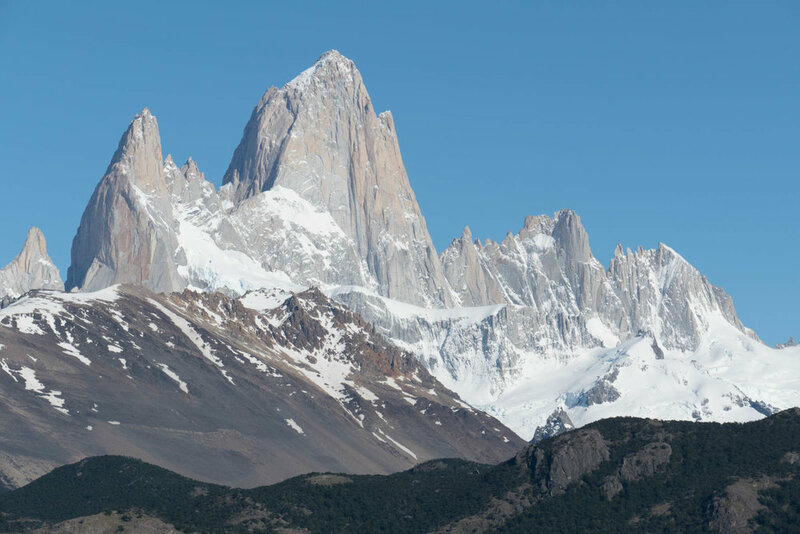 The hike offers the best view of the Cerro Torre, a striking set of peaks with a glacier emptying into the laguna. This hike is rated moderate and is 10 km each way. The initial and final parts of the hike are fairly steep but there is long stretch in the middle which is essentially flat. Again we had great weather for this hike. Laguna Torres with the Cerro Torre in the background. A disappointment of the hike was how murky the water in the laguna is, unlike the beautiful turquoise glacial water in most other lakes. Not sure why this is so for Laguna Torre. 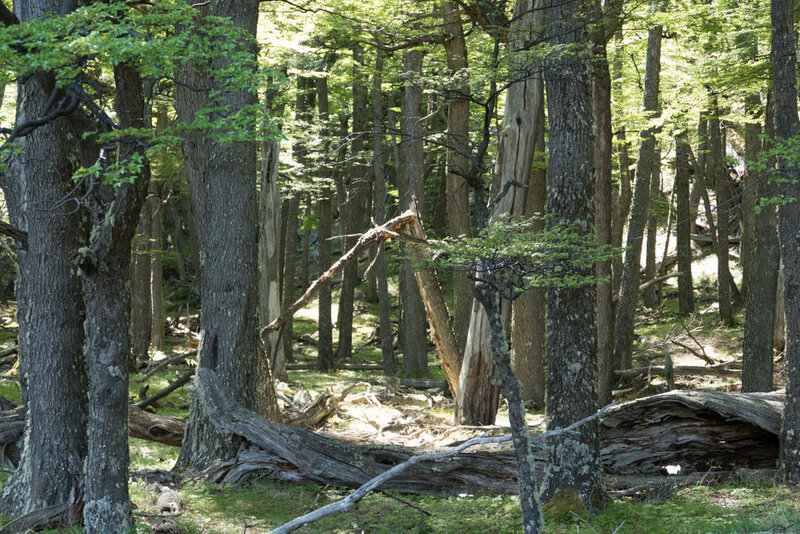 Typical forest that the hike traverses. 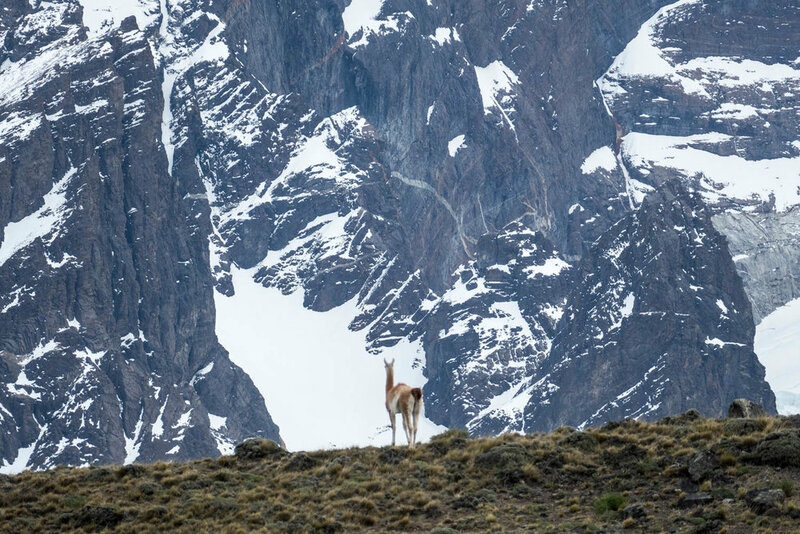 A highlight of our trip was the chance to watch and photograph the delightful guanaco which roams these mountainsides, sometimes in herds and oftentimes singly. Ironically we found these lovely creatures hard to find on hikes but numerous while driving around the parks. Since we were in a rental car, we could stop whenever we wanted to. 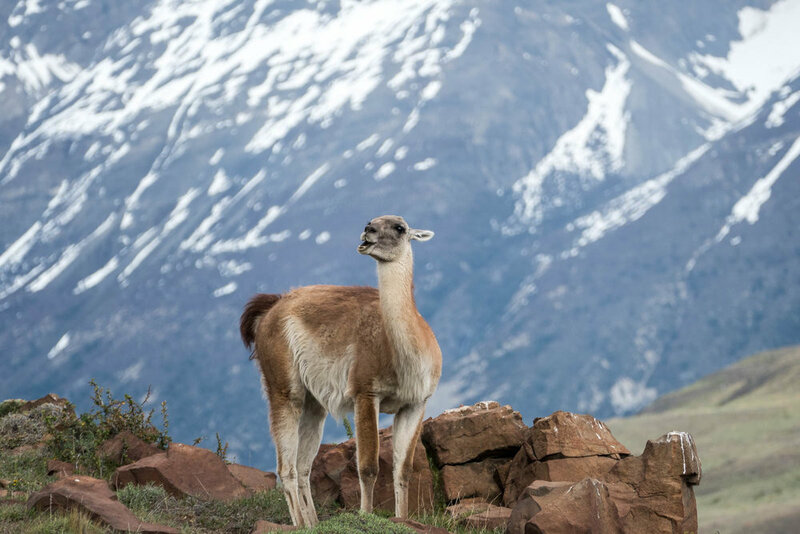 The most unusual feature of the guanaco, at least in the parks, is that they are relatively immune to the presence of humans. So they did not immediately shy away as soon as you stopped the car or as soon as they saw you, which allowed relatively close encounters. They also seem to prefer to be on the ridges rather than the valleys so that it was possible to get some great shots of them with the magnificent mountains in the background. 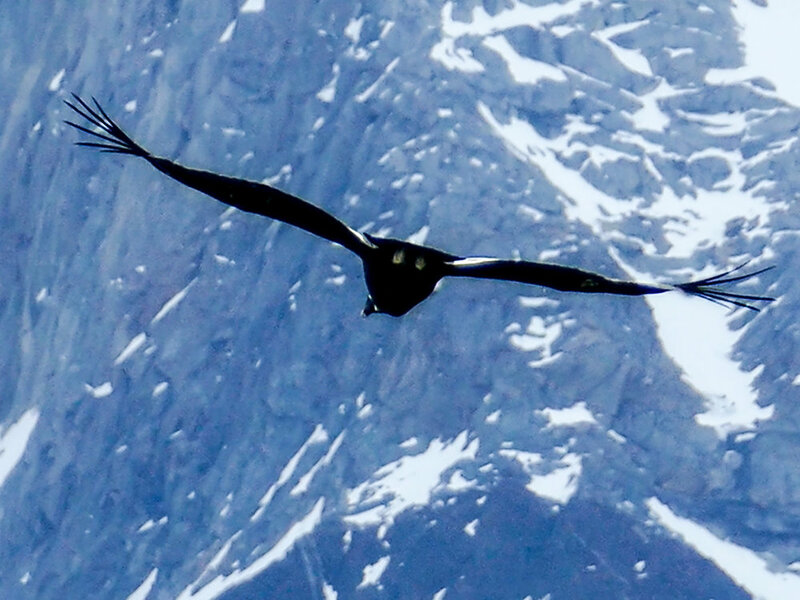 The other iconic Andean animal that we encountered on several occasions was the condor. Usually they are seen as they soar high in the sky. In Torres del Paine, the Mirador Condor is aptly named since there are indeed condors that make their nest in caves in the rock just below the summit. The caves are visible from the bottom, but not from the top, of the hike. 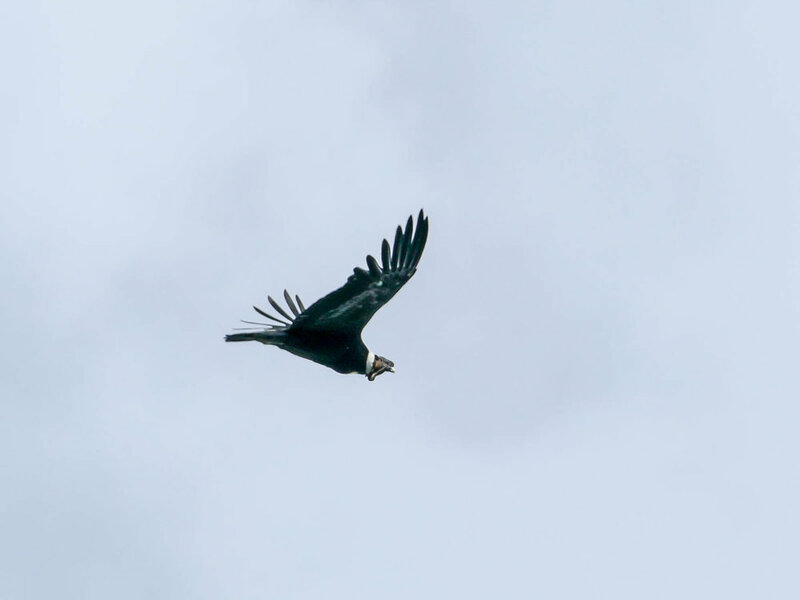 An unusual aspect of having the mirador higher than the nests is that one can get photos of the top of the condors, rather than the more usual view from below. Turns out condors are pretty much completely black on the bottom of their wings but have vivid white spots on top. 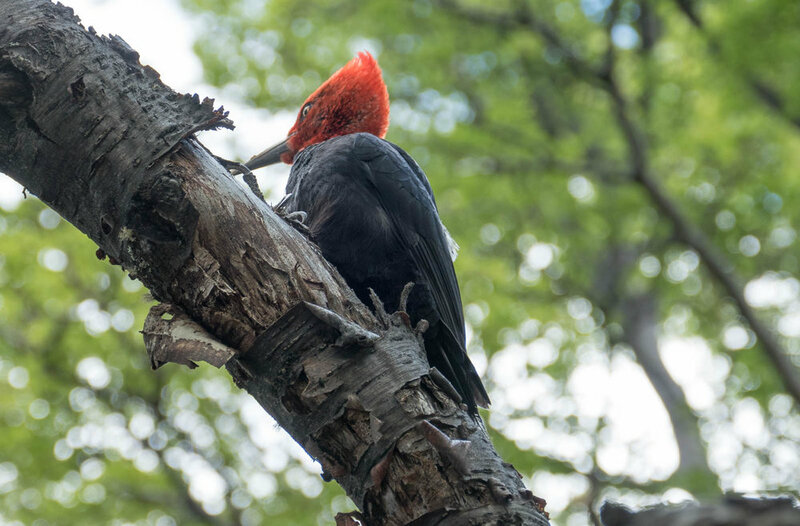 We were lucky to see a Magellanic woodpecker on one of our hikes. I first heard it knocking on a tree in the woods and it was so loud that it sounded like someone was hammering on a trunk. See the video by David Attenborough on communicating with this bird https://www.youtube.com/watch?v=MNmh5w6cj78. On a later hike we tried to attract some woodpeckers with the same technique but without success. We drove back to Punta Arenas to return the rental car and catch our flight home to Santiago. We had one day in Punta Arenas to visit the penguin colony on Isla Magdalena. In all of the guidebooks, it mentions that there is a smaller penguin colony that can be seen on the mainland at the Seno Otway Penguin Colony. Since our drive back to Punta Arenas from El Chalten took us past the turnoff to the colony, we thought we’d go for a short visit. But this was a mistake since the facility has been closed for over 3 years, we were later told, because all the penguins were gone. However, we did not learn this until we had driven to the locked gate over 15-20 kms of a terrible dusty road. There is still a prominent sign advertising the place on the main highway despite the closure for 3 years. In our guidebook it says that the ferry to Isla Magdalena only leaves on Tuesday, Thursday and Saturday and we were there on Monday so we were worried that our timing was wrong. However, we managed to book a tour for Monday (the last 2 of 3 tickets available, so they claimed) on the square in Punta Arenas. Although they mention a ferry from the city, it seems like the usual tour with Solo Expediciones is to take a minivan for about 20 minutes north of the city to a small dock ‘near’ the island. The tour leaves the city at 7:30 AM and we had to have a place to park our rental car for the day, so we arranged to drive out to the dock, which is very close to the turn off for the Seno Otway colony with which we were familiar. If you are in a rental car, this may be the best solution to skirt the parking problem. The boat ride to the island is about an hour each way and on the day we went the winds were high and the ride was very rough, especially on the way back. Several people on the boat had to make use of the seasick bags. If you are prone to motion sickness, be forewarned. Our guide was very knowledgeable about the ecology of the penguins and could converse in many languages. Each group is only allowed an hour on the island to try to minimize the stress to the animals. What one sees on the island very much depends on the time of year. There can be a very large colony of the Magellanic penguins (over 100,000) at the right time. When we were there in mid-November, there were not large numbers of penguins visible because virtually all of the penguins were either incubating eggs (usually two) in the burrows or out to sea to hunt for food. The island is home to over 50,000 (!) nesting pairs of penguins (and the same number of burrows!) so in the right time of year one can imagine that the scene would be dramatically different. I think you would have to come in about February to be able to see the young penguins with a parent. Despite our poor timing, there were no shortage of penguins to be seen. We were told that the chicks usually hatch in mid December and stay in the burrows for some time before they can amble outside. By the end of February, the chicks are old enough to go to out to sea and hunt on their own. Curiously the parents stay at the island for another month to recuperate from the child rearing before they leave the island to hunt. The young chicks do not return to the island for several years, until they are ready to breed. Presumably there are very few penguin on the island from about May to September, when mating season begins. The birds are monagamous and use the same burrow from year to year, sometimes having to fight off intruders intent on the burrow.